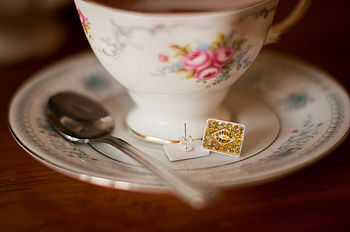 Jewellery featuring homeware motifs counts enough to be on a homes blog, right? Well, maverick that I am, I'm gonna share it anyway. In my quest for Queenie-themed merch for an impending Jubilee Street Party shoot taking place within my Day Job, I stumbled upon these beauties. I've always been a sucker for anything supersized or supershrunk, and these adorable miniatures fall just to the right of twee and just to the left of Dalston cool, landing them squarely within the confines of Very Good Place To Be. With a nod to the fabulous oversized biscuit cushions of Nikki McWilliams, designer-maker Jodie Anna draws inspiration from childhood memories and Great Britishness, printing her Photoshop-finished images onto shrink wrap plastic to create these perfect miniatures. We're sure Her Maj would approve.